The Jumbos (14–0–3) progressed to the Sweet Sixteen of the NCAA tournament after beating the Stevens Institute of Technology Ducks, 1–0, on Sunday. Having secured a first-round bye, Tufts entered the match at Bello Field in Medford with fresh legs. Meanwhile, Stevens had to play its second game in as many days, after its match the previous day against Gordon College went to a penalty shootout. After Tufts’ last two games of the regular season went into overtime, the team’s focus against Stevens was to get on the board early and retain the lead. The Jumbos piled on the pressure early, with one of their best chances coming at the 4:44 mark. Junior midfielder/forward Gavin Tasker, in his usual spot on the left wing, fed junior forward Joe Braun who cut, unmarked, into the box, received the ball and fired a shot on target. However, senior goalkeeper Aaron Henry was there to make the save, his first of eight total. Despite the Jumbos’ strong start, the visitors gained momentum and forced the game into the middle third of the field with some strong offensive plays. The Ducks’ best chance came close to the end of the half, when senior midfielder Haddy Abdelhady crossed a ball toward the net. Senior goalkeeper and co-captain Conner Mieth was able to get a hand to the ball to bat it away from the head of an onrushing Stevens player. The Jumbos edged the Ducks in shots in the first half, 5–4. The second half was all Tufts, as the hosts finally settled down. The Jumbos were awarded eight corners to the Ducks’ none in the period. They also stepped up their offense production, winning the shots battle 10–3, and it seemed only a matter of time before the attack broke through. Less than five minutes into the half, Van Brewer powered a left-footed shot from the corner of the box that Henry was able to tip over the net for a corner. Junior midfielder Brett Rojas took the resultant corner, which was tipped behind for another corner. Van Brewer stepped up to take a corner from the other side, and the ball landed in the box in front of senior defender and co-captain Sterling Weatherbie, who put a foot to the ball only to have it cleared off the goal line by a lucky defender. The Jumbos won four corners during a two-minute stretch halfway through the second period, but they were unable to finish each time. Rojas, Van Brewer and junior midfielder Jack Delaney all produced several tantalizing chances for the Tufts offense. One free kick by Van Brewer in the 77th minute curled and ricocheted off the left post. Soon after, the Jumbos generated two more chances through sophomore defender Biagio Paoletta and sophomore defender/midfielder Calvin Aroh, respectively. The breakthrough finally came 10 minutes from the end of regulation time. Weatherbie took a long throw-in from the right wing that Braun flicked into the box via his head. Paoletta tapped the ball to Tasker, who rocketed a right-footed volley into the net from only a few feet out — there was nothing Henry could do as the ball sailed over his head. The Jumbos held on for the victory, allowing only one more shot before the final whistle. Another aspect of the Jumbos’ second-half dominance was stronger wing play. In the first half, Stevens shut down Tasker on the left wing and junior midfielder Zach Lane on the right, when that pair is often responsible for creating chances and wreaking chaos on opposing defenses. Paoletta had a particularly strong game on Sunday, killing fast break attempts and also creating his fair share of offensive chances. The Fairfield, Conn. native took four shots, with three on target. With the victory, Tufts will now face conference rival Amherst in the Sweet Sixteen on Saturday at Bello Field. The Mammoths (14–4–1) defeated the Saint Joseph’s Monks, 4–2, in the second round after downing Bridgewater State in the first round. 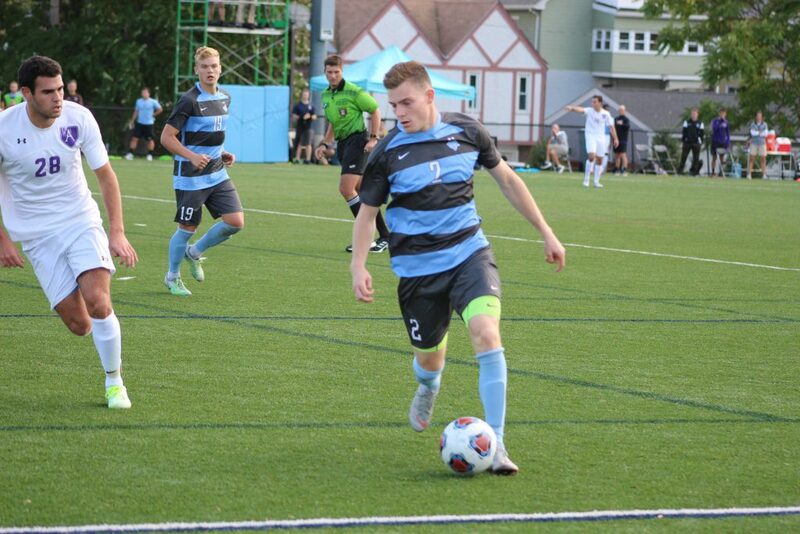 The NESCAC foes will face off for the second time this season, as the Jumbos emerged with a 2–1 victory on Sept. 29 in what was the Mammoths’ last regular season loss. Amherst progressed to the semifinals of the NESCAC tournament, where they fell 3–1 to the Colby Mules. The matchup will be sure to test Tufts’ defense, as Amherst is the top-scoring NESCAC team with an average of 2.21 goals per game, compared to Tufts’ 2.00. The teams have historically been among New England’s best programs, and they enjoy a staunch rivalry with each other, with the Mammoths serving the Jumbos their only regular season loss in 2017. Both teams have earned a NESCAC title since 2014, a stretch in which Tufts has won two national championships and Amherst has captured one. Saturday’s winner will take on the winner of Montclair State vs. Ramapo College in the Elite Eight on Sunday. The Mammoths and Jumbos will kick off on Saturday at 11 a.m. at Bello Field.